VCard or VCF is a virtual contact file containing contact information in a standard format. It is used to attach and transfer contact data via email or any other form of electronic data transfer. In the vCard, contact data like name, email, address, company and more details can be stored. 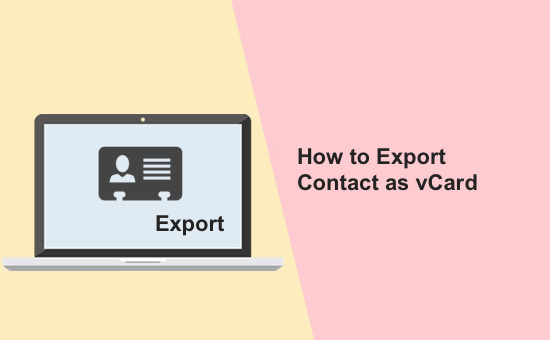 In this tutorial, we are going to see how to export contact data to a vCard using PHP. Previously, we have seen PHP contact form example to get the contact details from the user. 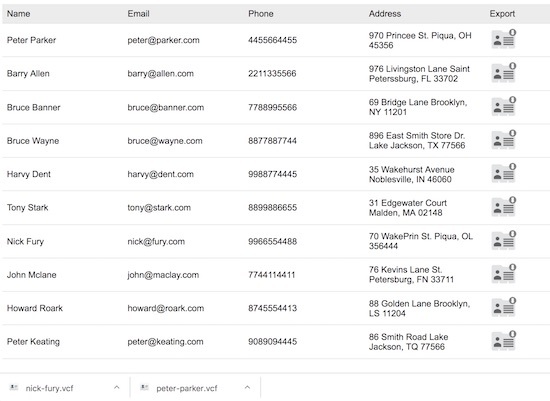 In this example, the user contact and company details are stored in a database table. 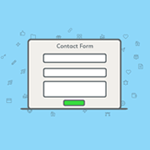 Check Iris for professional, secure, spam-free contact form. Data for contact is retrieved using PHP from the database and listed in a tabular format. In this list, each item will have an option to export data to a vCard format. Once exported, the vCard will be downloaded to the browser. Previously, we have seen several examples to export database results to various format like CSV, Excel. I have used Jeroen Desloovere’s vCard PHP library for exporting contact data to vCard. Download this library from Github and put it in your local environment to run this example. This is the landing page to display the contact details from the database in a tabular form. In this PHP example, I have used MySQL prepared statement for performing database operations. Initially, the query is executed for getting all the contact details into a PHP array. This array of contacts are iterated and displayed in a tabular view with vCard export option. By clicking this vCard Export control, the PHP export action will be called. Then the contact data will be exported to a VCF file and downloaded to the browser. In this PHP class, the required vCard library class is instantiated. With the reference of this instance, the contact data is added to an object array. This contact data object will be passed while exporting data to the VCF file. This vCard PHP library requires Behat-Transliterator library for transliterating the name. So, download Behat-Transliterator library and use it as a dependency to run this example. This is the PHP class created as a database controller to handle database connection and fetch data with PreparedStatement. The runBaseQuery() function receives and executes the query without params. In the runQuery() function, it gets the query, param type, and values as its argument to bind with the query statement. This function is used to fetch contact data by id for exporting it to a VCF file. This screenshot shows the list of contact details with the vCard export option. On clicking this vCard icon control the contact detail will be uploaded to a VCF file.